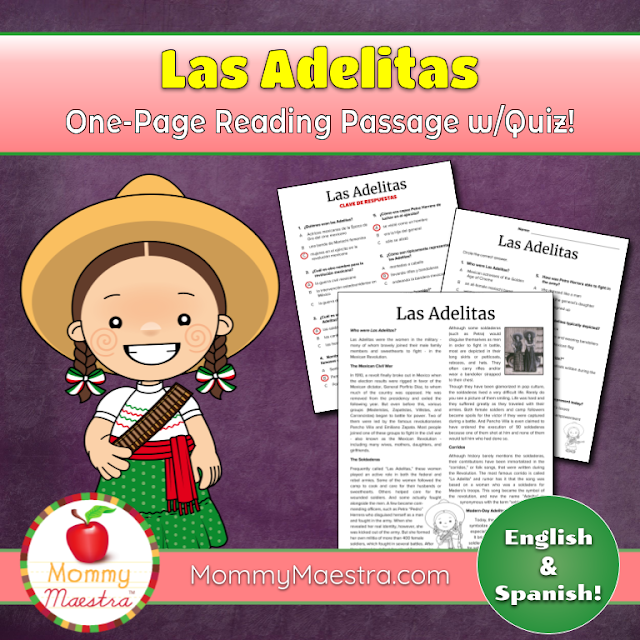 Are you looking for information on las Adelitas to share with your children or students? If so, MommyMaestra has you covered with several resources for different ages. Today is the last day of Women's History Month, so I created this one-page reading passage with a brief history of las Adelitas. But their story has been largely ignored by history. We've had to rely on family histories and even corridos to learn about them. But word-of-mouth is powerful and the image of Adelita has persisted and spread. It's even featured in a children's picture book by the popular children's author and illustrator, Tomie dePaola. Titled “Adelita,” it is the Mexican version of the Cinderella story and tells the tale of a young woman fighting for her future. My one-page reading passage (shown at the top of this post) comes with an 8-question reading comprehension quiz and answer key. As with all of my one pages, the file includes both the English and Spanish versions. To extend the learning, you can pair it with this excellent video from PBS about las Adelitas. You might watch it in class and use the reading passage as a history center or homework. • Here is an excellent article on Medium about the Revolution and the Adelita's role in it. The article is packed with great information and has beautiful photos. How the Women “Adelitas” Helped Win the Mexican Revolution of 1910: Women played an essential role in Mexico’s cultural shift towards economic and racial equality during the early 20th century. • For a more in-depth study, check out this article (thesis?) in the McNair Scholars Journal from Grand Valley State University:: From Soldadera to Adelita: The Depiction of Women in the Mexican Revolution. Pon, pon: A jugar con el bebé!